A Lo blow for comfort. Firstgear Kili Boot comfort and protection for those who like it on the down-Lo. Nice addition to my riding gear. Boots look and feel good for a nice price.Can't tell about all day comfort or how good they are in the rain because it's winter here and about 5 degrees. I didn't buy these from Revzilla the first time, but regardless of that, these boots are great! My first pair were worn through about 30k miles and the soles were finally starting to lose traction. I ride whenever weather permits and just to work and home is 110 miles round trip. Ridden in downpours, ridden in hail, ridden in 90 degree weather. - Durability for me was true to what you'd expect from FirstGear. 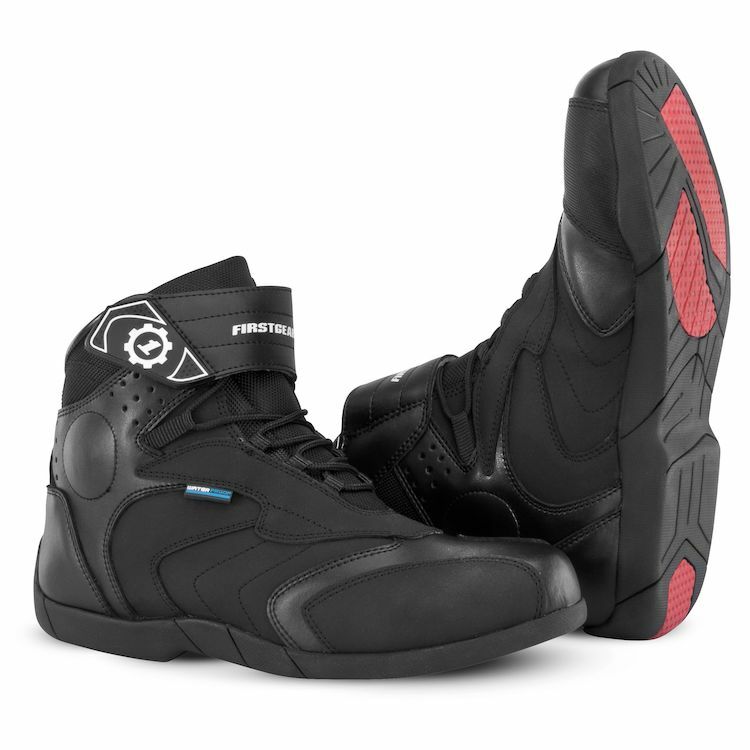 - More comfortable than any other motorcycle boot I have worn when walking around. - Due to being waterproof, breath-ability is a bit hampered, though the fact that my bike gives off a lot of engine heat around my ankles also contributes to this con. In the end, I honestly would recommend this boot to anyone and am in the process of purchasing my second pair. Love them, love their looks. I was looking for a "casual" shoe for rides that don't require offload boots. Ideally, I wanted something that I could wear off the bike, too. The Kili Lo looks good. That fact that is is supposedly waterproof is a nice add, although I cannot attest to that claim, yet. * the sole is flat and rather stiff. That's good on the bike I think, but somewhat uncomfortable when walking. Maybe that gets better after breaking in. * runs large. Since they only come in full sizes, and I usually wear EUR 42+ I got a 9, which according to the size chart on the box, is a 43 (see picture). Maybe an 8 would fit better, but with socks it's ok. Note that the "centimeters" and "inches" measurement on the box seems to refer to the length of the shoe, not the foot. for reference, my foot measures 10.25 and a size 9 is a little long. * laces are too long. I'll cut them down to remove excess length as I am afraid of them getting caught up somewhere. * lettering on the flap is a bit too bold, more of a style choice, obviously. I love these boots! Quite snug, but no pinch points. I usually need shoes that have a slightly wider than average fit (not quite enough to need a size wide, though). Haven't had a chance to test the waterproofing during a ride, although I did have to step through a puddle or two. The waterproofing means the airflow is a lot lower, though. Drawbacks: the rubber on the heel of the boots started to peel off. Granted this is because I instinctively tried to use my feet to help get the boots off, but I wish it were more sturdy. Easily fixed with some contact cement. I was learning to ride by taking my MSF course and needed a good pair of boots, I found these on clearance and decided they might be good boots, I got them and tried them on they fit a little big but were tight enough on my feet, and they look like regular shoes and have enough design to them to wear around like regular boots! would recommend to buy these! I bought this when putting together my first set of riding gear. I wanted something that had good protection that I could still walk in. They fit snug after adding a thin insole for comfort, but after breaking them in a little they were much easier to walk in. I bough these looking for a good deal, low cost. They work great, feel great. Now that I have them I want something a little more sport, atractive, wich will probably be more stiff, and expensive. But yes good buy, recomended, like the mention it is like the swiss army boot. I just got these boots and so far I love them. The fit is true to size. They seem solid and light. I went on a 2 hour ride and then a 2 hour hike with these boots and they were very comfortable. I will have too get used to the toe when shifting, I have never worn boots so it is a little disconnecting, but the rubber pad make it easy once used to it. This boot was out of the box tight! However, it quickly formed to my feet and felt comfortable with a few adjusted laces. Wasn't a big fan of the laces, but for the price, it was good. Now for the waterproof area! Feet were dry during a monsoon in the NC mountains and i mean buckets of rain! No leaks, no puddles in my boots. Great boot for the price and will recommend them to others.